Here’s the latest For the Birds column, which runs in several New England newspapers. The seasons are changing, and there’s a lot going on in the birding world. Warblers and other songbirds are migrating south. Shorebirds — many species of which have long migrated already — continue to move through New England. Other small winged creatures — monarch butterflies — are also seen more often now as they prepare for their generational migration. On the ponds, the waterfowl migration hasn’t started with verve yet, but wood ducks, which spend much of the summer hiding out, are more often seen and heard in the fall. At the same time, herons and egrets are still with us in large numbers, and feeder birds continue to keep us company in our backyards. Yes, a lot is going on in early fall as we birdwatchers start to shift from a summer frame of mind to a winter one. With all that’s going on, one type of bird still manages to take center stage in September and October: hawks. Hawkwatches are the primary destination for birdwatchers this time of year as birds of prey by the thousands ride the wind south. Pick the right day with the ideal weather conditions, and a birdwatcher may see hundreds of hawks, falcons, eagles and vultures soaring overhead. Identifying birds high in the sky is a challenge, to say the least, even big birds such as hawks. That’s where organized hawkwatches come in, or at least sites where hawkwatches are popular. New England boasts several spots for hawkwatches. Do an internet search for “New England Hawkwatch” and find one in your area. It’s worth the trip, but don’t delay, hawkwatching season is fleeting and winds down near the end of October. Experts at these spots can ID the birds in a second, even when the birds are still miles away. Don’t be afraid to sidle up to an expert or stick your nose into a group of experts. I always do when I visit a hawkwatching site and find it invaluably helpful. Birders are more than happy to share their knowledge with other birdwatchers. I understand as well as anybody that you can’t always pick the days you can go birdwatching, but the best days for a hawkwatch are generally when a northerly wind is blowing. Warm temperatures and good visibility don’t hurt either, from a comfort standpoint, at least. Hawks, of course, are specific types of birds, but the term “hawkwatch” encompasses falcons, ospreys, eagles, harriers and vultures, as well. The different types of hawks usually follow a predictable timetable for their journeys to South America. 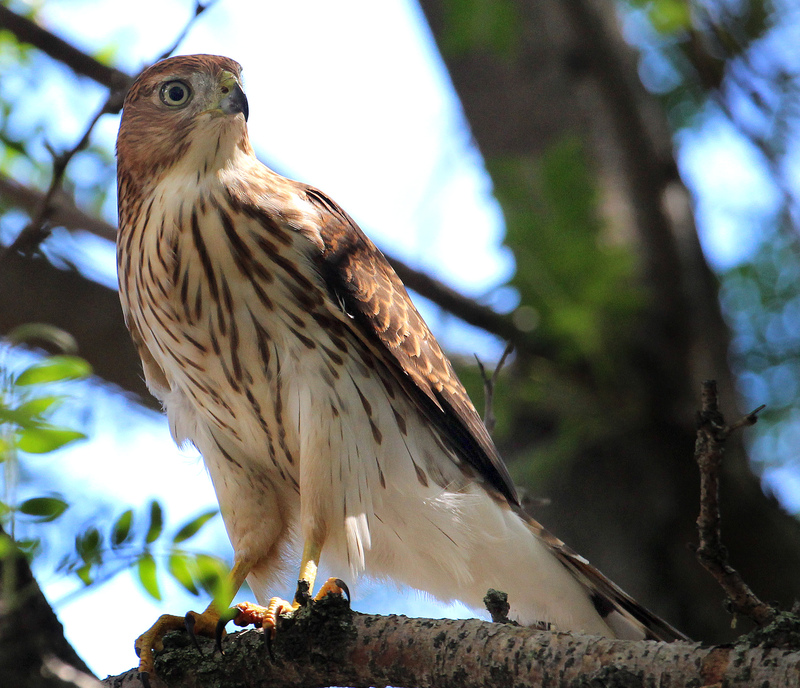 In general, broad-winged hawks, ospreys and kestrels pass through New England first (early to mid-September), followed by harriers, the accipiters (Cooper’s and shark-shinned hawks), red-tailed hawks, and red-shouldered hawks. Autumn is full of joys for nature enthusiasts — I didn’t even get into it being the breeding season (rut) for deer and moose — but the season wouldn’t be complete without a good view of hundreds of hawks headed to their winter homes. An immature Cooper’s Hawk rests in a tree after eating a songbird in Norwalk, CT, summer 2015. 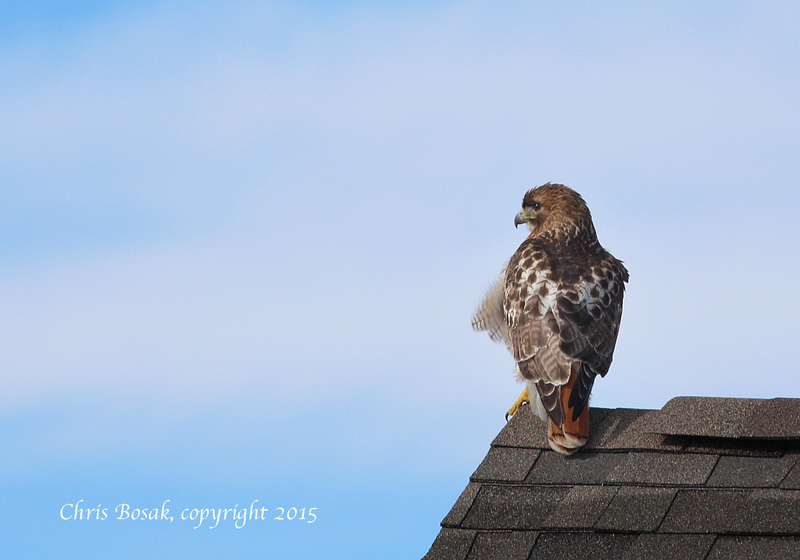 This entry was posted in Birds of Prey, For the Birds column, Hawks and tagged chris bosak's for the birds, hawkwatching in New England by Chris Bosak. Bookmark the permalink.